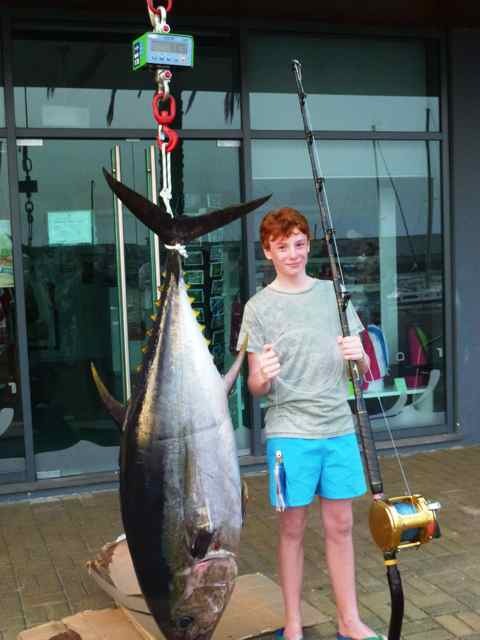 Junior angler Axel Bowmer recently traveled to the famed Portuguese island of Madeira to experience the amazing offshore fishing that can be had there. While trolling a Melton's Cherry Jet on July 8th with Capt. Gerard DeSilva, Bowmer hooked into a huge Atlantic bigeye tuna (Thunnus obesus) that ripped line off his Penn 130 reel. After 35 minutes in the fighting chair, he finally subdued the 88.31 kg (194-pound, 11 oz.) bigeye that qualifies him for the potential new male Junior record. The current IGFA record stands at 187 pounds). BigeyeTuna.net © 2019. All Rights Reserved.